Page Street Publishing, 9781624145223, 144pp. The origin of Taartwork Pies, Brittany Bennett’s Brooklyn-based bakery, was her Oma and an old, crumpled piece of paper that held a very special recipe— one that her Oma brought all the way from Amsterdam. Since then, all of Brittany’s standout pies have incorporated that perfect pie crust recipe— a sweet, crispy texture with a hint of lemon, a combination that gives these pies that extra special something. With simple, fresh ingredients, you can create a dessert that will have family and friends coming back for seconds—or even thirds. Enjoy recipes like Traditional Dutch Appeltaart, Strawberry-Thyme Balsamic Pie with Ricotta Whip, Rose Hip Poached Cherries with Pistachio Crumble or Plum and Juniper Berry Tart—each one celebrating in-season produce to capture the most dynamic flavors. And with each filling, you have the option of using Oma’s Dutch Taart Dough, Chocolate Dough or Vegan Dough, so there will always be new flavor combinations to try. As Brittany’s Oma would say, it’s not just about eating, it’s about indulging in the time spent together. So gather those closest to you, crack open The Taartwork Pies Cookbook and create new memories with every delicious treat. 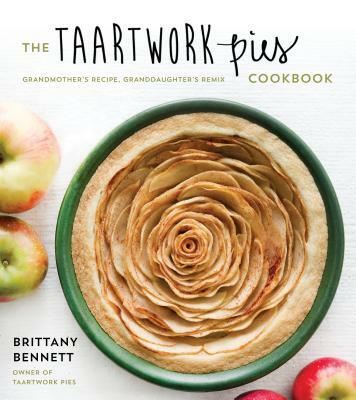 Brittany Bennett is the owner of Taartwork Pies. Her pies have appeared in Vogue, Bustle and W Magazine and her writing has appeared on NYLON and The Coveteur. She lives in Brooklyn, New York.